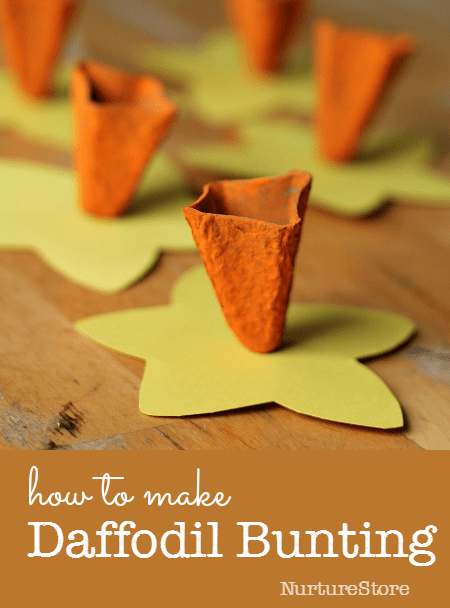 Here’s a beautiful, simple spring craft – daffodil bunting! Here’s one of my all-time favourite spring crafts – daffodil bunting. After the dark winter months when there’s been very little growing in our garden it’s always such a joy to see the bright green stems of daffodils peeping up. This spring craft lets you bring that happiness inside and wrap it right around the wall of your home! Made from recycled materials, it’s a lovely eco-craft too. 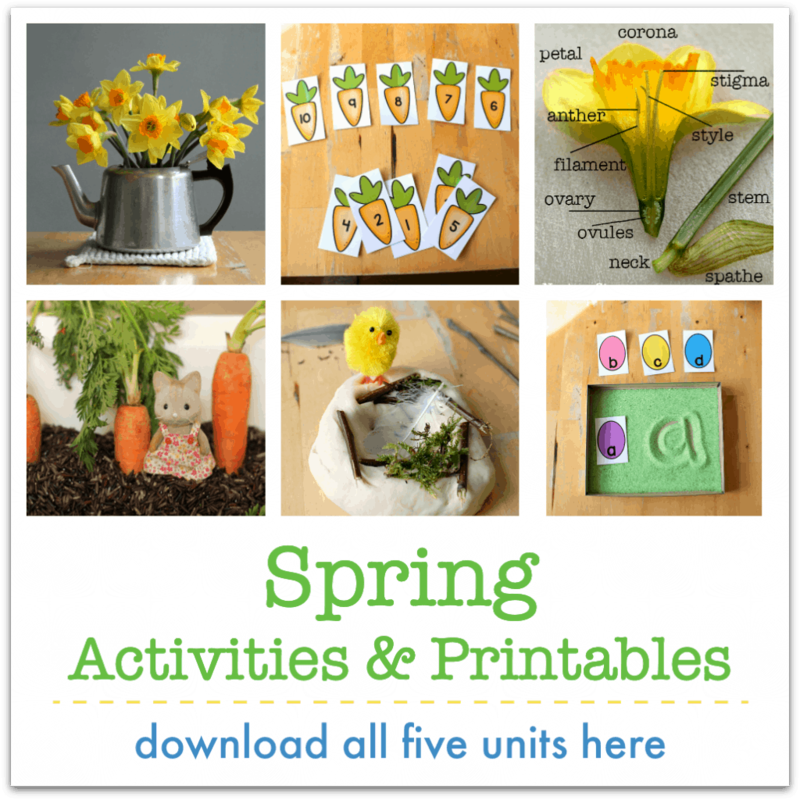 Start by looking at some real daffodils with your children, counting the petals and talking about the shapes and patterns. Then draw out some daffodil ‘star’ shapes onto card, either freehand or by using a template. Paint your daffodils yellow. We used a sponge to apply our paint and enjoyed using a different technique to our usual paint brushes and noticed the patterns we created were just like the real flowers. Once the paint has dried, cut out your daffodils. We used a fairly thin card and the wet paint made the card bend a little as it dried – which turned out to be perfect as it gave the daffodils a more 3D shape. Cut out the centre parts of your egg boxes to make the trumpets for the daffodils and paint them yellow or orange. Paint them inside and out. 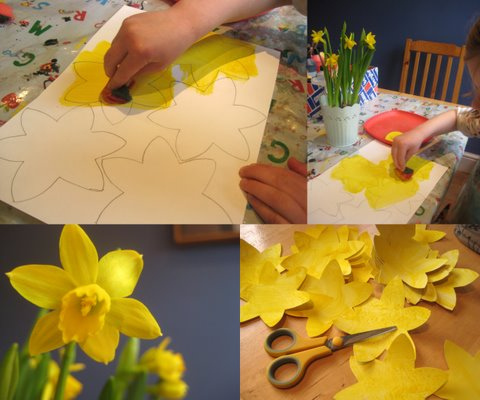 Once the trumpets are dry, glue one into the centre of each daffodil star using craft glue (or sticky tape) and leave the daffodils flat until the glue dries. Attach some wool, string or ribbon on to the back of each daffodil using sticky tape and then hang up your daffodil bunting to decorate your home. See our complete Daffodil Unit here. I love your daffodils! Such a creative way to use materials, and so cheerful. Thanks for stopping by my blog! Very pretty 🙂 followed you from we play at child101! I love the daffodil bunting. I will have to save this idea for our (southern hemisphere) spring. The bunting turned out great- Yellow makes me feel bright and happy! The children planted daffodils last year in our front flower bed. They loved watching the green buds slowly poke through the ground and grow into beautiful flowers. They should be popping through the ground soon! What a wonderful way to celebrate the arrival of spring! how cheerful! Can’t help but feel happy looking at that bunting! We made similar daffodils this week but put them on lollypop sticks. I love the idea of making bunting with them though, will have to make some daffodil Easter bunting. BTW, I’ve only just discovered your website and I think it’s so wonderful. The activities are simple and low cost making them very appealling and accessable. You are an inspiration! Thank you Butterfly Babes, that’s a lovely thing to say. As a mum and a childminder I always want ideas that are simple and low cost myself, and I’m really glad they’re useful for others too. These flowers are lovely, but putting them on bunting makes them fantastic, you have inspired me to buntingise lots of things now. Hi Chapter Forty – go forth and buntingise! Oh very pretty and so cheerful! Perfect for spring and the lovely weather! They look great on that blue wall too! SUCH a cheerful bunting! Full of spring-time warmth. daffodils are my absolute favorite flower. thanks for the tutorial. I love this daffodil bunting! I think you’ve earned a spot in the features for next week, thanks so much for sharing on Craft schooling Sunday! How cute! daffodils are my birthday flower! Ca-ute!! Thanks for linking up to Mad Skills Monday! Oh my gosh, that is so pretty! What a fun spring garland! I love it! Thanks for linking this up too! Very pretty! Daffodils are so springy and beautiful! I just found your blog and I think it is fab! Thanks for the great ideas and inspiration. I adore your daffodil bunting…especially the 3-D center! Such a great spring project! Thanks for the invitation nicolette – I shall pop over to see you! Thanks for linking up to the all year round spring carnival! That’s such a brilliant idea, they look so lovely. Thanks Vicky. I love them too – I feel like I’m encouraging the spring on a little when we make them!